SWAP 'EM IF YOU GOT 'EM 2017 is our third consecutive clothing swap for the people of the local Pittsburgh area. 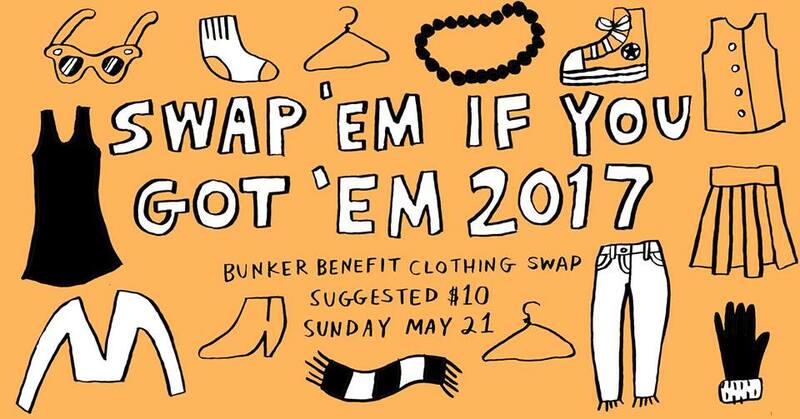 Come find new styles and raise money for Bunker Projects non-profit programming! SWAP ‘EM IF YOU GOT ‘EM is ALL INCLUSIVE. There will be something to swap for all shapes, sizes and orientations ♥ The dedication of our participants and volunteers help make this event feel like a true “pop up shop”. Bring your clean (no stains please!) clothing items, accessories, shoes and bags. Spring/summer vibes encouraged but any and all clothing is welcome. Along with donating your fabulous clothes to swap, there will be a $10 suggested donation (cash!) that benefits Bunker Projects! You bring your desired number of awesome swap items this Saturday (11am-4pm at Bunker) + $10 and get to swap-shop in the galleries Sunday, 12-4pm! Clothing collected: SAT MAY 20TH, 11am-4pm. "Swap ‘Em If You Got ‘Em"